Looking for a fun and engaging resource to bring literacy to life in your classroom? Try children’s magazines! Magazines are a wonderful supplement to classroom instruction. Students are exposed to a wide variety of texts and lots of interactive content. From stories, poems, and action rhymes to nonfiction, crafts, puzzles, and games, kids’ magazines can offer an abundance of high-interest content to support your curriculum. As a kindergarten teacher, I love using magazines in my classroom! My students get so excited when we share a new magazine issue! Literary children’s magazines often feature characters and story lines that appear in each issue. It’s exciting for children to follow the adventures of these familiar characters. They can’t wait to see what their “friends” are up to next. Literary magazines are full of content that supports growing readers in their literacy development and inspires their love of reading. With colorful artwork and photos, magazines bring an array of content to life for young readers. Magazine pieces offer short text and can be used for instruction in many literacy skill areas. Students are exposed to a variety of texts that encourage them to read, listen, learn and interact with engaging content. Literacy skills such as story elements, main idea, details, characterization, cause and effect, predictions, inferences, and more can be addressed in a fun way with the wonderful content offered in kids’ magazines. In my classroom, we share digital magazine issues on our interactive white board and use our document camera for the print issues so all students can see and interact with the content. Students love to use our interactive white board pens to complete the puzzles, games and activities. They enjoy highlighting sight words, rhyming words, and vocabulary words. The stories, poems and other features are great for building rich vocabulary. My students look forward to each new issue and love returning to browse through magazines in our classroom library. High interest, nonfiction articles found in magazines are great resources for teaching text and graphic features. These features include captions, headings, bolded words, content vocabulary, sidebars, charts, and graphs. 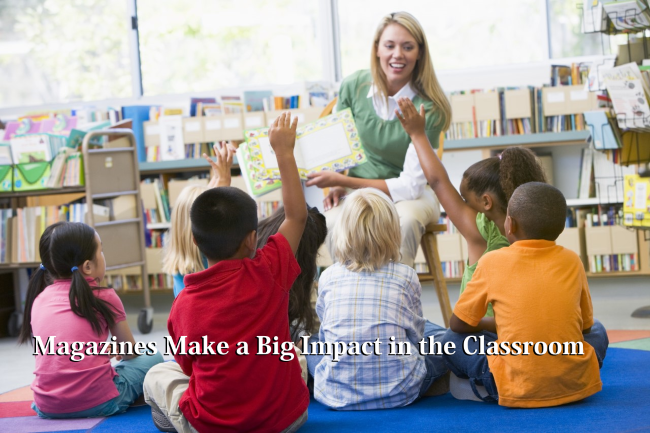 Visual aids help students connect with text and make topics come to life. Magazines can offer timely topics that connect with content areas. Content can include history, science, nature, math, technology and the arts all in one beautifully illustrated magazine. These articles can offer a springboard for further discussion and research and can support what students are learning in the content areas. My students often share that they tell their families about the topics they explore in a magazine. This often leads to family conversations and further exploration at the library and through online resources. They love coming back to tell me all about the new information, photos, and videos they discovered! Lots of magazine experiments, recipes, crafts, games and other activities can also be shared at home as a way of engaging families in literacy and learning together! Magazines offer a wide variety of writing opportunities as students respond to the text and create their own pieces modeled from the various features offered in a magazine. In my classroom, students enjoy writing their own captions and stories inspired by photos and illustrations found in magazines. Students can create their own poetry inspired from poems they read in magazines as they use the poems as a scaffold for their writing. For the youngest writers, teachers can use a shared writing experience to create a class poem together with students creating their own poems following the shared experience. Features such as rhyming text, alliteration, onomatopoeia, similes, and metaphors can be explored in the poetry and prose featured in the magazine. Magazines often feature a section where readers can write letters to the editor on a variety of topics. These letters can be a springboard for budding writers to explore letter writing. Children may have opportunities to submit their own poetry, jokes and artwork to some children’s magazines. Many children’s magazines offer additional resources for parents and teachers that pair well with the magazine’s content. Check out magazine websites to find resources such as digital editions of the magazines along with teacher’s editions that correlate common core with the magazine’s content. Websites offer many resources and interactive content such as online games, activities, crafts and downloadable content to print for use in classroom activities. Magazine blogs and newsletters are great resources for further exploration of content and include lots of useful tips and information to promote literacy and learning at home, in the classroom, and in the community. Many magazines offer thematic content on topics in science and technology, history and current events, the arts and more. There is so much offered that can connect with students’ interests and experiences. All this fun content offers ways of getting kids excited about a topic and that excitement can lead to extended inquiry and learning in the classroom and beyond! Bins full of children’s magazines are a wonderful, enriching addition to a classroom library! 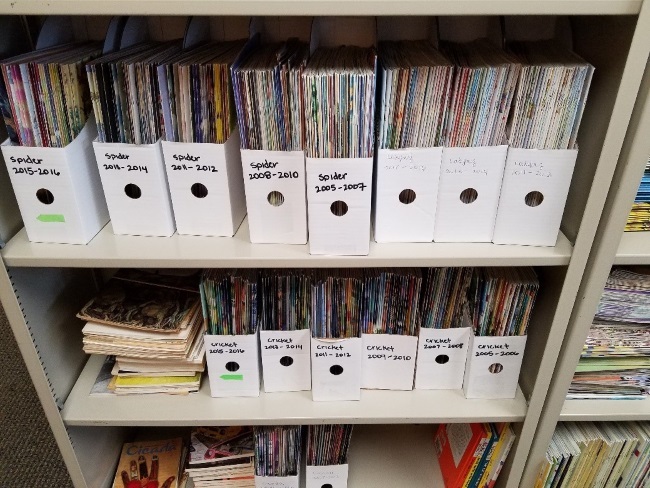 Keep bins of magazines accessible for students to browse and read when they visit your classroom library. There are many ways of building a collection of children’s magazines for the classroom. Ask your HSA to help support your class and school library with subscriptions to a variety of children’s magazines. Check your local library to see if they can donate back issues of magazines that they may be clearing out to make room for more current issues. Borrow current magazines from the public library. Scout used bookstores, yard sales, thrift stores, online auctions and library book sales for magazine back issues at bargain prices. Some children’s magazines have digital editions that can be purchased at a reduced rate and can be shared on interactive whiteboards. Ask families to donate issues of magazines when they are finished reading them at home. Ask local pediatrician offices and other places of business to donate past issues of kids’ magazines. Ask families to donate a children’s magazine subscription to your classroom when your school participates in magazine fundraisers. The rich language, delightful artwork, and multi-genre texts found in children’s magazines are wonderful for teaching a wide variety of skills, concepts and topics – and most of all, for sharing the pure joy and wonder of words and art! Editor’s Note: Check out Cricket Media’s Magazine in the Classroom webpage for info on teacher guides and other educator resources. Sue Gagliardi is a kindergarten teacher and children’s author. Her fiction, nonfiction and poetry appear or are forthcoming in several children’s magazines including Ladybug, Spider, Highlights Hello, Highlights High Five, Boys’ Quest and Fun For Kidz,. A picture eBook titled Benjamin’s Bookshelf is forthcoming with Houghton Mifflin Harcourt’s Curious World. In addition, she writes nonfiction reading passages for the Center for Educational Testing and Evaluation (CETE) through the University of Kansas. She received a Letter of Merit for Fiction for her story, “Just Enough for Me” (Ladybug Magazine, Sept. 2015) in the Society of Children’s Book Writers and Illustrators (SCBWI) 2016 Magazine Merit Awards. She lives in Hatboro, PA with her husband and son. 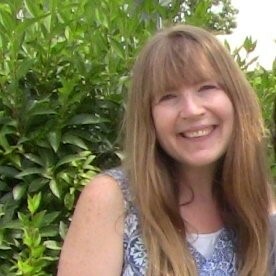 You can visit her website at www.suegagliardi.com and connect with her on Twitter @Sue_Gagliardi.